In December, 2003, BusinessWeek Magazine interviewed Joseph Engelberger, the robotics pioneer. The article was entitled "How Robots Lost Their Way." Included in the article was a plea for money to build an eldercare robot which Engelberger thought could be built with then-current technologies, rented for $600 per month, operated at a cost of $1.25 per hour (compared to healthcare homeworkers who cost around $15 per hour) and developed at a cost of less than $700,000. "The robot I'm working on will be two-armed, mobile, sensate, and articulate. It doesn't need to communicate a great deal to meet the needs of an 85-year-old. A human can ask: "What's for lunch?" and the robot can respond with what it's able to make, or it can say: "We're going to Johnny's," or "We just had lunch." The voice recognition, behavioral systems and artificial intelligence necessary to do this are ready. Most of the other technologies are, too. We don't need more navigation development — getting around an apartment is easier than moving through a hospital or on Mars, which robots do now. I could prove this functionality with the right partner for about $700,000 in 14 months or less." I phoned him and started a many-day conversation on the subject. He was a fun character to talk with and I learned much in the process. But when we got to the part where I offered him the money he said he needed, he said, "No. I don't want your money. You're just an investor. I want money and partnerships with Panasonic (NYSE:PC), or Johnson & Johnson (NYSE:JNJ), Philips (NYSE:PHG) or Siemens (NYSE:SI); they're in the business [healthcare products], have deep pockets, and have what I need for the robot to be successful:  design and manufacturing capability and  marketing experience in the health and eldercare marketplace." Nine years later Engelberger's eldercare visions are still a work in progress in research labs around the world. Products are emerging but very slowly and their solutions are not as broad-based and flexible as Joe imagined. Most are single-purposed and not for home use; and none are produced by the companies Engelberger mentioned. Panasonic (NYSE:PC) has a line of robotic hospital devices; Johnson & Johnson (NYSE:JNJ) discontinued their iBot stair-climbing wheelchair; Honda (NYSE:HMC) and Toyota (NYSE:TM) showcase their walking research robots but other than robotic lawn mowers (Honda) don't have any robots available for purchase. Although recent European studies indicate that there is resistance to having elderly people minded by a robot, when given the choice of robotic care versus moving into a care facility, the resistance disappears. Another study from GA Tech showed that seniors preferred robotic help for household chores but not for personal needs (help getting dressed, bathing, etc.). This knowledge – and the spreading aging demographics of Japan, the US and other countries, is propelling research into home healthcare robots such as the one which appeared in the movie Robot & Frank earlier this year. The many stakeholders in robotic healthcare (family members and caregivers; healthcare providers; technology providers; aging or disabled individuals) all have similar goals: to provide independence, preserve dignity, empower those with special needs and provide peace of mind to all of the stakeholders. Every major robotics university and research lab has some form of healthcare and quality of life research including home care robots: GA Tech has Cody; CMU has HERB; the Fraunhofer Institute has Care-O-Bot, Yale, USC and MIT are running a NSF-funded Socially Assistive Robotics project; CIR and KAIST in Korea have their own robot projects, etc. Nevertheless, the multi-purposed home healthcare robot Joe Engelberger envisioned back in 2003 still hasn't emerged – and specifically hasn't surfaced from any of the major home healthcare providers. Instead, present-day strategy appears to be to provide high-cost, high-need, single-purpose devices, spun off from university research, and marketed to hospitals and rehabilitation facilities, and wait until the technology develops further – or the political climate changes dramatically – before releasing Engelberger-style lower-cost, more capable, multi-purposed robots designed to be affordable and mass produced by the likes of Panasonic, Siemens and Philips, for home use. "There are easier markets than eldercare. To build a viable home robot requires significant expertise in a number of sub-fields, which naturally opens doors to other markets that are easier to monetize. Consider Kinect, Siri, IMUs (inertial measurement units with accelerometers and gyros), photo mapping like Google Maps, etc. We've seen MAJOR industries and products pop up around each of these. Why focus on building an integrated system when there's so much fertile ground in these other markets?" "The political climate in the US just isn't committed to robot healthcare solutions — at least not in juxtaposition to defense robots. Just imagine a DARPA robotics challenge for healthcare robots… Instead of BigDog, we could have Service Dogs; instead of PetMan, we could have an in-home helper; instead of soldier extraction, we could have robotic nurses. Sure, DARPA's current challenges will ultimately help advance all of these, but why not tackle it head on? The saddest part… real healthcare robot advances (like Johnson & Johnson's old iBot wheelchair) are discontinued due to burdensome regulatory environments. Half of Mr. Engleberger's $700,000 could be eaten up by consumer safety certifications." Multiple and single tasked mobile robots to detect people lying on the floor, remind them about taking their medications, provide remote video and audio for caregivers and medical personnel, act as a security robot in the night to detect intrusions, fire and smoke and to call for help, etc. Governmental and other agencies, particularly in countries with socialized medical systems [countries without insurance providers] such as Sweden and Denmark, have stepped in to develop necessary devices where healthcare consumer product companies have yet to tread. For example, RobotDalen, a Swedish public-private consortium has funded the development of needed robotic products such as Bestic, an eating device for those who cannot feed themselves; Giraff, a remote-controlled mobile robot with a camera and monitor providing remote assistance and security; TrainiTest a rehabilitation robot that measures and evaluates the capacity of muscles and then sets the resistance in the robot to adapt to the users individual training needs; and Zoom, an all-terrain, battery-powered four-wheeler intended for people who have difficulty walking. Once fully developed, Zoom will be able to drive up stairs and steeper terrain in a manner that is safe and secure for the driver. 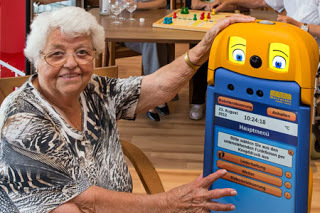 Another public-private partnership is the EU-funded $10 million CompanionAble Project which created a robotic assistant for the elderly called Hector. The project integrates Hector to work collaboratively with a smart home and remote control center to provide the most comprehensive and cost efficient support for older people living at home. Although Hector doesn't have any arms, he does have storage space for drinks, keys, and other items and his communication skills have been honed to work intuitive and effectively with seniors. Needed legislation and ethical considerations are also addressed in this very comprehensive P-P project. The four year project, in the final stages of field trials in Holland and Belgium, is now seeking multi-year funding to extend their research before commercialization. "CompanionAble addresses the issues of social inclusion and homecare of persons suffering from chronic cognitive disabilities prevalent among the increasing European older population. A participative and inclusive co-design and scenario validation approach drives CompanionAble involving care recipients and their close carers as well as the wider stakeholders. This is to ensure end-to-end systemic viability, flexibility, modularity and affordability as well as a focus on overall care support governance and integration with quality of experience issues such as dignity-privacy-security preserving responsibilities fully considered." In the U.S., funding from the NSF has been focused on concept development projects like the Socially Assistive Robotics project referenced above, and university quality of life projects. Very few have reached the stage where commercialization is warranted. From left: InTouch Health's RP-VITA remote presence robot; VGo in pediatric out-patient setting; new Double Robotics Double device. Remote presence robots, which didn't exist when Engelberger talked with BusinessWeek, have recently turned up in a variety of forms — from simple Skype video chats on a mobility platform (Double Robotics) to serious medical assistance remote presence robots such as provided by the partnership between iRobot (NASDAQ:IRBT) and InTouch Health , Giraffe (shown above) and VGo Communications' post-op pediatric at-home robots for communication with parents, nurses, doctors and patients. Remote devices with the ability to carry things, similar to Hector (shown above), may be the next breakthrough followed by adding a single arm and a repertoire of tasks which that arm can perform and then, later dual arms and app stores full of programs the robot can follow. "Beginning with features and functions already commonly included in today’s personal computers and adding autonomous mobility and a few additional components with innovative applications and a human-centric interface design, the Hoaloha design will not only take existing PC experiences directly to the user –wherever they are – , but also open up new ways for individuals to stay connected, informed, and entertained while improving safety and access to remote services." "The Hoaloha application framework will also provide integration of discrete technological solutions like biometric devices, remote doctor visits, monitoring and emergency call services, medication dispensers, on-line services, and the increasing number of other products and applications already emerging for the assistive care market." "In addition, because the design is also based on wireless PC technology, the Hoaloha solution will provide a bridge to the existing digital and Web-enabled world." "Finally, at the heart of the Hoaloha design is its ”human-centric” user interface. Designed to leverage and integrate natural interface modalities like speech, vision, and touch technologies, its interface is designed to be socially interactive and easy to use." One can only hope… and, like Joe Engelberger, be a bit frustrated with the slow progress thus far.